My father was seventeen years old when he got a chance to play trumpet with Rudy Vallee at the Brooklyn Paramount, just as The Great Depression was, well, depressing. My lovely mother a mere lass of fifteen waited at the stage door to meet this handsome talented Brooklyn-born new member of the Connecticut Yankees. Morris (Larry) and Sophie (Sonnie) loved music, they loved each other, and rumor has it they loved me. As a youngster I was told that if I practiced diligently I could get to Carnegie Hall. Well the old joke aside, I got to Carnegie Hall, usually to listen to performers and friends I knew or wrote about... so technically, the old saw came to pass. Tom Goodkind of the Washington Squares did announce from the venerable stage that I taught him a "great new banjo lick" which he played as the crowd applauded. My first ovation at Carnegie Hall. And my last ovation at Carnegie Hall. They were opening for Richie Havens a year or two before I had that opportunity. On national television John McEuen of The Dirt Band (while recounting a story of our meeting) mentioned me on Nashville Now, not by name, but as "the guy from the magazine." All of this is close enough for folk. I have performed for crowds as large as ten thousand and written articles and columns for "audiences" at least as large. Through it all, I made it a point to dissuade any and all fifteen-year-old groupies hanging out at the stage door. Still - I write, I perform. 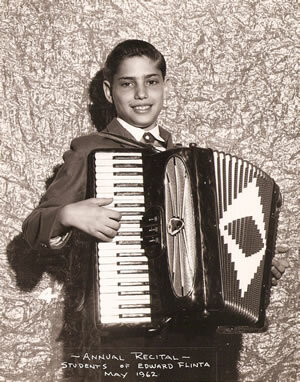 And, yes, I play accordion. Few know the sound of that particular treat. Welcome to this web site. I hope you enjoy. Mom and Dad would have been proud, Lawrence Welk somewhat less so. In the words of Rudy Vallee, "My Time Is Your Time." It’s been three years since the publication in book form of 15 Years of RagTag – a collection of essays and columns originally appearing in Sing Out! magazine between 1995 and 2010, written by Roger Deitz and illustrated by Ed Courrier. While print books remain, and certainly digital books could yet be sold, Ed and I have made the judgment to share our collaboration of these 56 columns with our community. And to let fly on Pete Seeger’s birthday, as a nod to the inspiring musician and activist we knew and admired. This in tribute to Seeger, and to Sing Out! magazine, founded in 1950 by Pete Seeger, Woody Guthrie, Paul Robeson and a host of others. Sing Out!, where editor Mark Moss encouraged me to write these columns and features, and Ed to illustrate them. Art and Commerce. In a world where the line is often blurred, it is better to be read than on the remainder table. No pun intended. Enjoy, and thank you for reading! Please share the book with your friends. The New Jersey Folk Festival announced Sing Out! columnist and advisory board member Roger Deitz is the recipient of its 2012 Lifetime Achievement Award. The NJFF conferred the award at the festival on April 28, 2012. 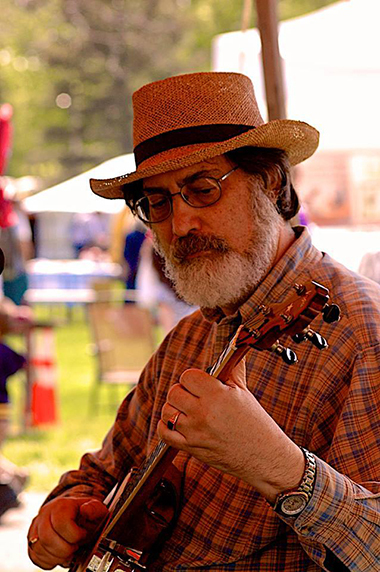 Dr. Angus Kress Gillespie interviews Folksinger and Columnist Roger Deitz. Look for Video on Demand, go to Old Ways in New Jersey, and then look for Roger's picture and click on it. by Roger Deitz, illustrated by Ed Courrier ... the complete edition is soon to be available as a free PDF! "A book so bold it dares to blow the lid off the contemporary acoustic music scene. 15 years of great humor writing with 56 collected RagTag columns from Sing Out! containing a few of folk's dirty little secrets and a tomato crate of commentary and laughs ..."